Made of non-tarnish nickel free zinc. The necklace is 18 inches long with an extender which can make it up to 20 inches long. Necklace Length (Approx.). 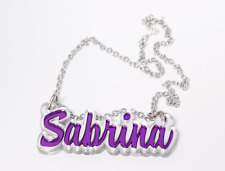 Type : Fashion necklace. Material : Alloy & Crystal. Name on rice necklace with chain-ASHLEY- pendant pre-owned w/NEW chain 16"
A Liquid filled tiny bottle with a grain of rice with the name ASHLEY on it. The pendant is pre-owned and slightly over 1 inch long. I put a New, never worn 16 inch chain on it. Silver tone necklace and bottle cap. Very good condition. Great for a gift or stocking stuffer.